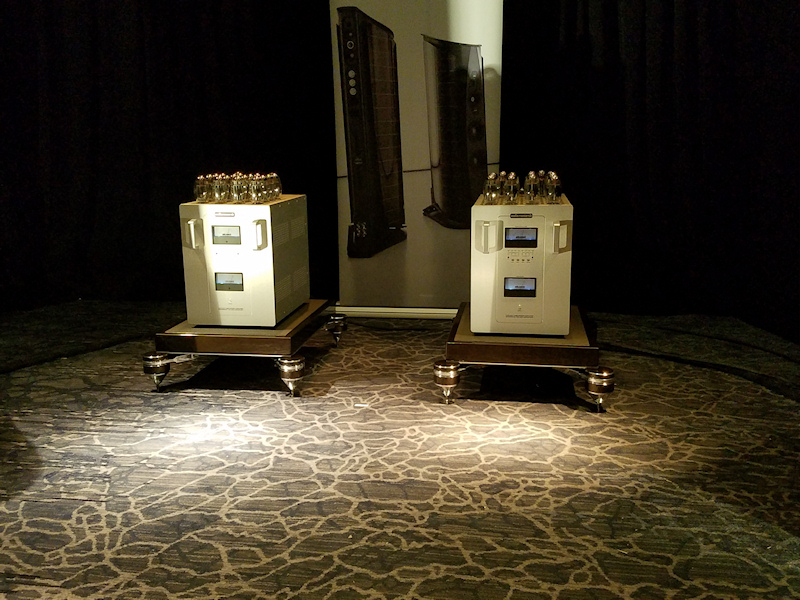 My only regret from AXPONA 2018 is that I didn't take the time to track down other Sonus faber models at the show. 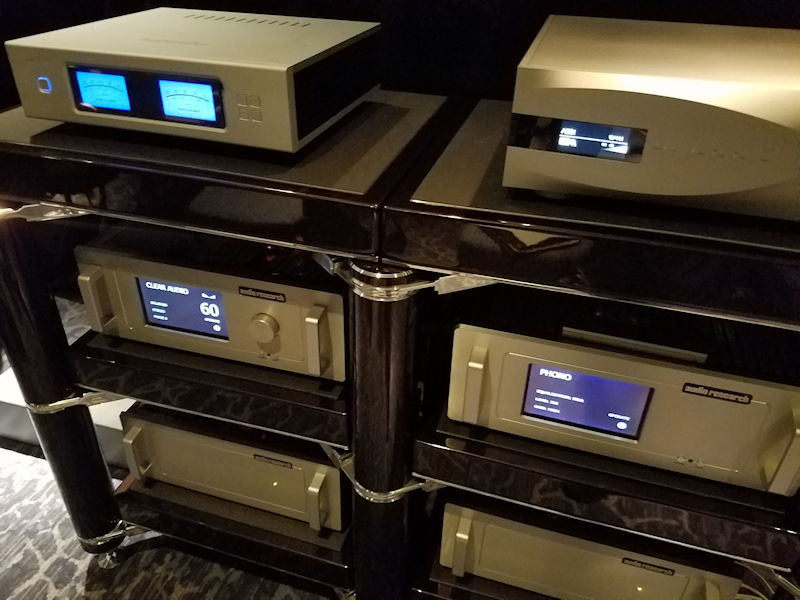 The directory showed that Sonus faber was set up in the Connection, Knowledge, and Perfection conference rooms, but the Aidas were in the Connection room and Wilson loudspeakers were in the Knowledge and Perfection rooms. 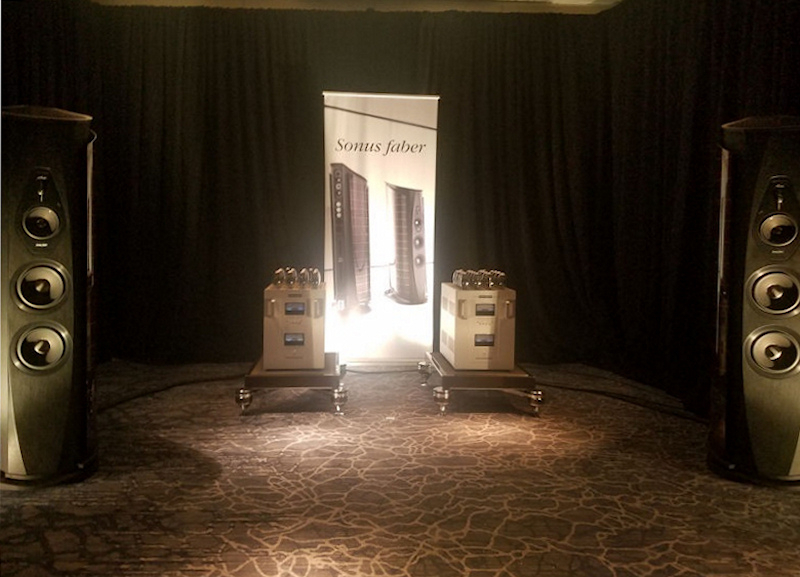 Will Kline, Sonus faber's U.S. brand manager, said there were other Sf models on exhibit, but he didn't know where they were since he didn't have a hand in setting up those exhibits. 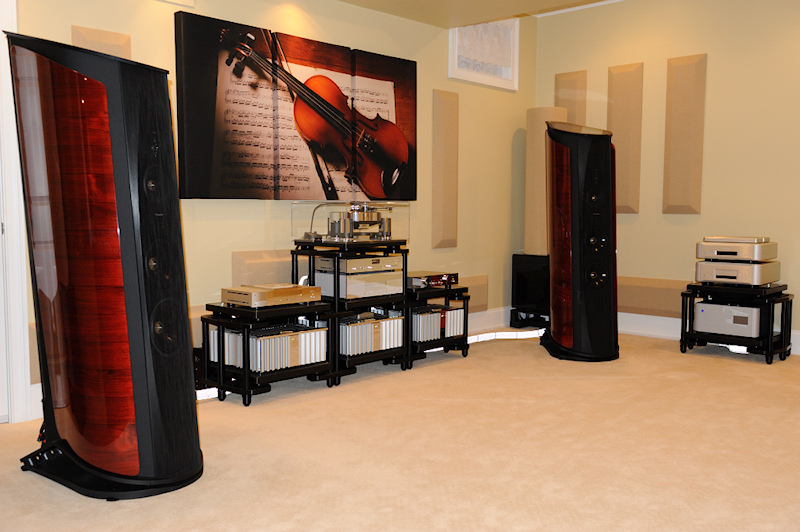 Will and the staff from Quintessence Audio were excellent hosts and really made visitors feel welcomed. They were very accommodating in answering all questions and in playing requests, either from their demo music collection, music subscription service, or from digital or vinyl music that visitors brought with them. From the second I opened the door to the conference room, I was drawn in by the life-like and dynamic sound of the Aidas. Over the years, I had been told that if I ever wanted to move up, up, and away from my modified, hotrodded, SDAs, I would probably be happiest with Sonus faber models, as they have similar sonic signatures. Indeed, the Aidas were not a stark departure from the sound of my bespoke SDA SRS 1.2TLs. Outside of the differences in spatial rendering, which no conventional loudspeaker can compete with, the Aidas just gave me much more of what I am used to and what I like in the areas of natural, musical sound, dynamics, clarity, and detail. A Sonus faber dealer, who also owns a pair of SDA SRS 1.2TLs, told me that I would like the sound of the Aidas, but that I wouldn't particularly care for the imaging properties. He was right. But again, I don't particularly care for the imaging properties of any conventional loud speaker. I spent a total of 4.5 hours over three days listening to the Aidas. Sonus faber claims that the Mk II Aidas are not merely a small collection of incremental improvements, but rather a complete internal redesign of the speaker. This experience taught me what my dream loudspeaker would sound like: It would have the speed, clarity, detail, resolution, liquidity, dynamics, and build quality of the Sonus faber Aidas coupled with the sound stage, image weight, image stability, bass characteristics, and tactile sensation of my hotrodded SDA SRS 1.2TLs. Market realities being what they are, I don't expect that such a loudspeaker will ever be manufactured, even though it is technically possible to produce it. Figure 1. 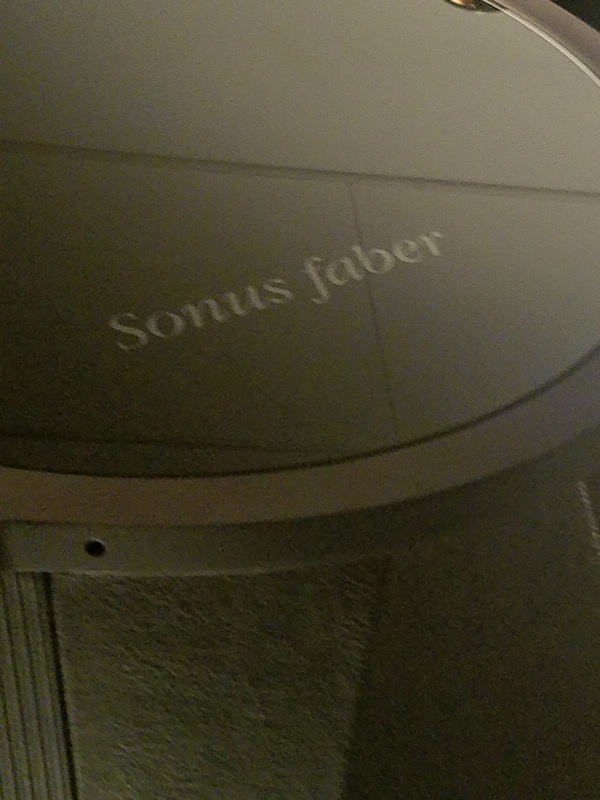 One of the first things Will taught me was how to pronounce Sonus faber. I had been pronouncing "faber" as "fay-ber". The correct pronunciation is "fah-ber". Italian vowels, I was instructed, are "soft" vowels. Figure 2. The Aidas were set up in a large room with spectacular associated electronics. The Connection conference room had dimensions of 42' L x 20' W x 11' H. A perimeter of thick black drapes was set up around the room a foot from the walls. Therefore, the acoustic space was 40' L x 18' W x 11' H. The room dimensions come from a hotel brochure listing the dimensions and seating capacity of all the hotel's conference rooms. The speaker placement and seating measurements were taken with my own trusty Milwaukee Tools 25' tape measure. The Aidas were spaced 12' apart, center to center, and 3' from the side wall drapes. The front plane of the speakers was 10' from the rear wall drapes. The first row of seats was 8' from the speaker plane and the second row of seats (where the best sound and imaging was) was 11' from the speaker plane. Critical listening was done in the center seat of the second row. There were frequent dropouts when the Aurender music server played tracks from my USB stick. The same dropouts occured when the tracks were copied to the Aurender's hard drive. Will said he would have his tech support person look into the issue and he asked my to come back in about hour. I returned 90 minutes later and the problem was that the Aurender needed to be set up to play DSF format DSD files. No technical issues after that...just Good Sound. System total retail cost, exclusive of cables: $422,850. Figure 3. Left side: Aurender W-20 music server, Audio Research Ref 10 line stage and power supply. Right side: dCS Vivaldi DAC, Audio Research Ref 10 phono stage. Figure 4. 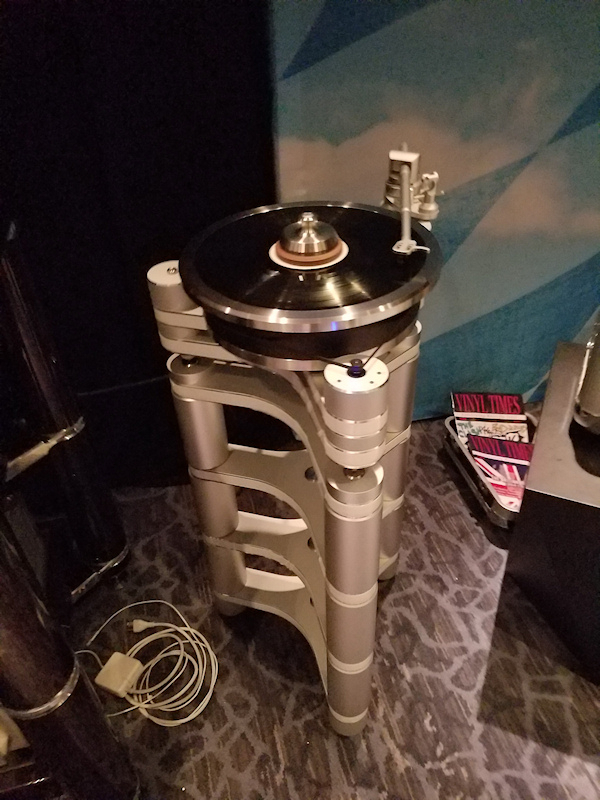 Clearaudio Master Innovation turntable and stand. No matter how beautiful they look or how wondrous they sound, I still firmly believe that turntables, and every other music disc spinning contraption...are from the Devil. Figure 5. Audio Research Ref 750SE mono block amplifiers, 750 watts per channel. Figure 6. People began to stare as I went around the room with my measuring tape, then sat down and began drawing "pictures". Sound characteristics and spatial properties were documented with maps of image placement and with notes on the sound quality of individual images. Sound stage width was confined to the outside edges of the speakers. No sound was projected forward of the front plane of the speakers. Depth extended back 8 feet from the front plane. Sound stage height, depending on the recording, was in the range of 5 to 6 feet. Images within the sound stage were life size, but not as heavy and palpable as with the SDA SRS 1.2TLs. Figure 7. I used to see pictures of Aidas paired with subwoofers and I would be puzzled. Why would speakers this large need help from a subwoofer? Answer: the Aidas are apparently built for speed and transparency, rather than visceral impact and tactile sensation. They didn't seem to move as much air as I would expect from a speaker of this size. The bass did not have the "thunderous" quality of the SDA SRS 1.2TLs. I didn't listen to any classical music on the Aidas, but I can see where their sonic attributes would be awesome in that application. The Aidas excelled in clarity, detail, dynamics and in presenting a convincing sonic illusion of real music being performed in three dimensional space, although that three dimensional space was much smaller in width and depth, and not as heavy as what I am used to. Nevertheless, the Aidas were very exciting to listen to. After the "Dynamic Drums" track was played, the man sitting in the seat in front of me remarked "I'm a drummer and my drums don't sound that good." Listening to "Dynamic Drums" on the SDA SRS 1.2TLs provides a more tactile experience, but not as startlingly dynamic as with the Aidas. Tom Jones' vocals and Jeff Beck's blues guitar on "Goin' Down Slow" gave me the life like sound of being at an actual blues performance. I could hear every vocal inflection, every nuance of the guitar strings. But again, the tactile sensation was missing. As I progressed through my evaluation tracks, I did not feel the tactile sensation from the sound stage that I am accustomed to, not even on bass heavy material, not even when I moved three feet closer by sitting in the front row. At home I feel vibrations from the music against my body and coming through the seat and armrests of my listening chair. I didn't experience any of that with the Aidas, in that room, with those amps. Also missing were the razor sharp, articulate, and growly bass transients I like. Aidas bass transients were more rumbly than growly. However, I think that may have been a due to the tube amplifier. I have never heard a tube amplifier reproduce acoustic bass growl and articulation similar to what I hear at a live performance, or even similar to what I hear from good solid state amplifiers. Powerful solid state amps excel in this area. Moving my head/body sideways a few inches left or right caused the sound stage to collapse and shift to the left or right respectively. Turning my head a few inches to the left or right, while still in the center, did not cause a total collapse of the sound stage, but imaging was diminished. At home, I can move my head laterally 1.5 feet either side of center without the sound stage collapsing. I can also turn my head a few inches to either side without the sound stage changing. I sometimes will turn my head to "look" at a sound image that is particularly interesting. If I were to replace my hotrodded, bespoke, SDA SRS 1.2TLs with the Aidas, it would be analogous to trading six of one to get half a dozen of another. I would gain 1) speed, 2) resolution, 3) clarity, 4) detail, 5) dynamics, and 6) build quality at the expense of 1) sound stage width and depth, 2) bass articulation, 3) bass transient performance, 4) image weight, 5) image stability, and 6) tactile sensation. In the future, when I am more dedicated to audio than I am now, I will pay Polk a handsome price to make me a one-off, custom pair of SDAs with the finest materials, drivers, and crossover components. Figure 8. 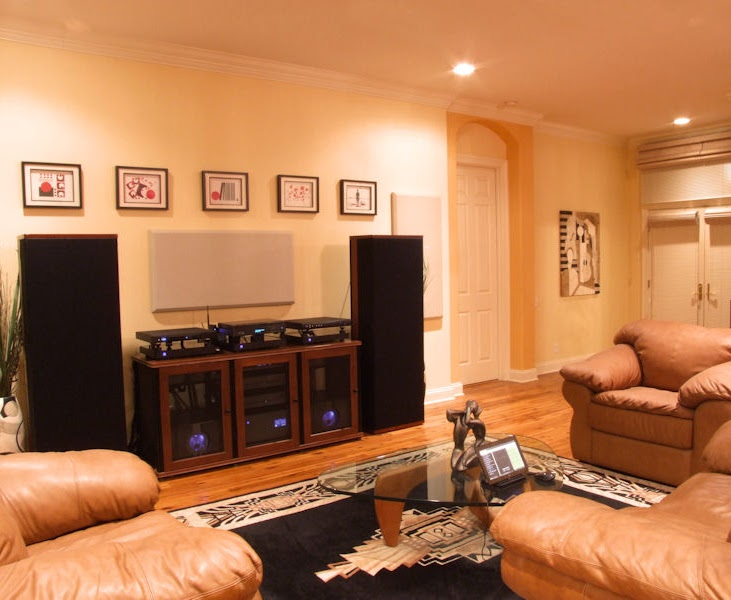 Like an errant husband who finally came to his senses, after days of exciting "flings" with other loudspeakers, I went back home to true stereo. I am more curious now about the smaller Sonus faber models and the performance losses as you move down the line from the Aidas. PS: Also, thanks for including the clarification of the correct pronunciation of "faber." We have enough talent here in this forum to do it now, and Polk will be happy to build you a plastic sound bar... let's just do it. per DK "at the expense of 1) sound stage width and depth"
Excellent write-up on the show, and the Aida's. We have similar taste in jazz music...heck "Mr Magic" was one of the first songs I ever performed live in middle school. Also, I remember that you play sax. 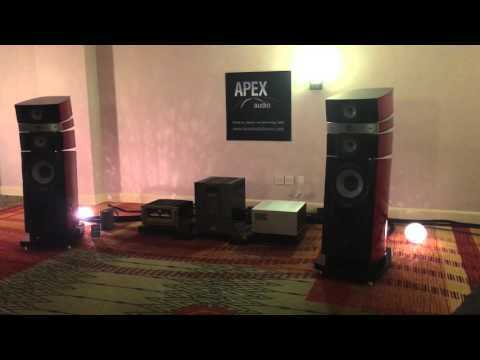 I play drums and I really wish you could have compared the Aida to the Focal Stella Utopia Em that Quintessence audio demoed several years ago (2014?) at the show. I listened to the original Aida myself as well as the Focals and both put out a large sound stage with amazing detail. However the Stella's produce very sharp and deep lower end impact. The speakers had full body sound in a very large room. It had a lot of the good of the Aida but was a different flavor for sure in overall presentation. I like a speaker with some kick and live presence myself being a drummer / rhythm section type listener. Too bad, as I think you would have liked some things about the Focals...for sure the image weight and tactile sensation you are used to. It would have been nice to have met you at the show...however I didn't make it this year and live only 1.5-2 hrs away. 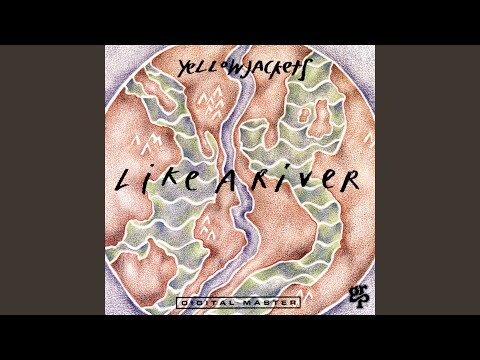 Given your taste, I think you would have loved one of my favorite demo tracks on the Focals, Yellowjackets - "Man Facing North" ..I know I did! I dug those Focal Stella Utopias also, sweet speaker that can do it all with great tone and weight.